A fine-tuned bilingual medical interpreter training aimed at reducing healthcare costs and raising patient safety. 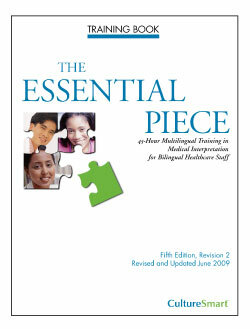 Culturesmart’s The Essential Piece™ courses prepare bilingual individuals to serve as medical interpreters. Our comprehensive curriculum uses realistic role-plays and lively discussion so interpreters develop the skills and knowledge base they need to deliver accurate, complete interpretation in health care settings. Prior knowledge of medical terminology is helpful, but not required. DAY 1: Foundation, Overview, and essential interpreting skills. DAY 2: Quiz 1. Code of ethics, interpreting logistics. Review of cardiovascular and respiratory systems. DAY 3: Language specific vocabulary review and role-play practice. General medical vocabulary and terms related to cardiovascular and pulmonology. DAY 4: Quiz 2. Patient culture and interpreting. How patients’ beliefs influence their views of illness. Culture brokering. Review of muscular, skeletal and nervous systems. DAY 5: Written midterm. Health care, health disparities and how interpreters may contribute to unequal treatment. Review of reproductive and urinary systems. DAY 6: Language specific vocabulary review and role-play practice. Terms related to orthopedics, rheumatology and neurology, obstetrics/gynecology, pediatrics and urology. DAY 7: Quiz 3. Participant presentations. Special topics. Review of competencies of a language interpreter. Challenging interpreting situations. Review of digestive and endocrine systems. DAY 8: Language specific vocabulary review and role-play practice. Terms related to gastroenterology and endocrinology and terms from other previously reviewed medical specialties. 5 hours of written examinations and interpreting skills assessments. Certificates of proficiency will be provided to all participants attending at least 90% of the total course hours and successfully completing the midterm and final course examinations. Typically, 70% of course registrants obtain a certificate on first attempt. CultureSmart only issues certificates to candidates who pass rigorous written and oral assessments covering skills and vocabulary. Our criteria mean so much that our certificate holders are eligible for 10 continuing education points from the American Translators Association. For more information about The Essential Piece™ or if you are interested in bringing this training program to your facility or your community, please select Contact us below or feel out our contact form. The 285-page fifth edition of The Essential Piece™ Training Book reflects changes in medical technologies, practices, and professions, making the book more relevant than ever as the basis of a 45-hour program for bilingual individuals wishing to become medical interpreters. 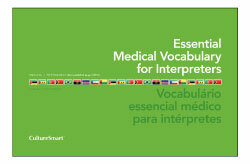 The glossary of essential medical terms incorporates the work of about 30 interpreters and includes vocabulary covering over 20 different medical specialties and body systems. 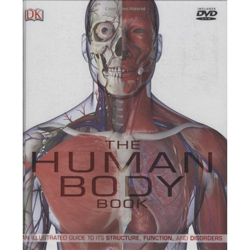 This is one of the best human body books available on the market. This book's 3D digital art and design is what separates it from other human body books. This hardbound book also contains a durable vinyl jacket and an interactive DVD.